In 2016, the founder of YAKUM went to Ecuador to learn about deforestation and agroforestry. In 2017 he returned and found some local ethnobotanical experts, with whom he visited many indigenous communities. 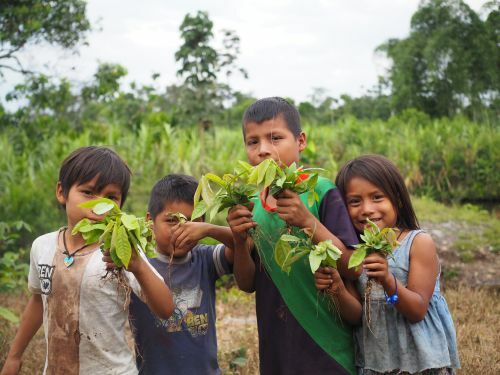 The Shuars in particular liked the idea of regenerating pasture-land with the forgotten foods and medicines of their forefathers and mothers, and over six months, they set up 15 small sites in ten Amazon communities, using over 100 culturally important species. They stayed with many families and talked for hours about needs, pressures, deforestation and cultural erosion. They often struck a chord when talking about food culture, nutrition and forest loss. They built a nursery in one community and it was incredibly successful. They built a couple more, and then a couple more. YAKUM now works with hundreds of community members in ten communities. YAKUM wishes to bring together core members of different communities to deliver permaculture and agroforestry workshops, ensuring that it not only “reforests” with them but regenerates, ensuring high yields, less pests and rich soil. The project’s vision is for these communities to become centres of excellence in Amazon agroforestry and conservation and lead the projects themselves, through capacity building and youth leadership development.